Begin your journey in Jundah, on the banks of the Thomson River with its panoramic river views and drives. Take the top road through to Windorah and relax under the majestic river red gums lining the waterhole at Cooper's Creek. Drive along black soil roads on the Barcoo River floodplains and boil the billy at the Barcoo River crossing. Discover the scenic River and Desert Drives in spectacular Welford National Park before returning the short distance to Jundah. This drive includes a mix of sealed and unsealed roads therefore a four wheel drive vehicle is recommended. Departing Welford National Park, return the short distance northwest to Jundah for the conclusion of your drive. Jundah is the closest town to Welford National Park and is an ideal base if you would prefer day visits. Located 90 kilometres east of Jundah is the site of Magee's Shanty, believed to be the site of the shanty immortalised in Banjo Paterson's poem "A Bush Christening." For more information call into the Jundah Visitor Information Centre and Library for friendly service and free internet access. Begin your drive in Jundah on the banks of the Thomson River - an ideal spot for some scenic fishing and river drives. Explore the Barcoo Shire Museum offering a window into the early pioneering times of the district and learn the unique process of the Jundah water treatment at the Reverse Osmosis Plant. Take the Settler's Nature Drive along the Thomson River featuring sign-posted descriptions of native plants. Unique "Welcome Signs" to the town replicate the historic shop front still to be seen in the main street of Jundah. Each of the signs is linked together by a walking trail, and contains different information giving an insight into the early years of the township. Meet local characters and enjoy outback hospitality at the Jundah Hotel, open for lunch and dinner and offering air-conditioned accommodation. Caravan Park and free bush campsites are available in Jundah. The annual Sheep Shenanigans event is held in June featuring sheep races complete with unusual jockeys. 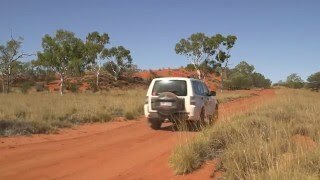 Proceeds benefit the Flying Doctor and Jundah Progress Association Inc.
From Jundah, take the top road over the Thomson River crossing and through ever-changing landscapes to Windorah, which is Aboriginal for "Big Fish". Windorah is 35 kilometres south of where the Thomson and Barcoo Rivers join to form the multi-channelled Cooper Creek. Local waterholes offer great fishing and the smaller channels are ideal for catching yabbies - the inspiration for the Windorah International Yabby Race held annually in August.